Thais, of course, speak Thai, of which the spoken part is a branch of the Tai-Kadai language, which originated in Southern China. The written part of Thai is based on Khmer, which is based on Indic, which is based on ancient Sanskrit. So, as you can see, it’s quite confusing - and we haven’t even talked about writing or speaking yet. 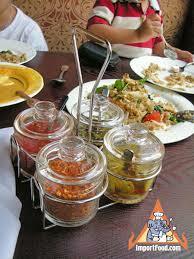 Now with that in mind the eating Etiquette has infusion of several Countries including neighbours Burma, Loas, Malaysia. Monks eat first. 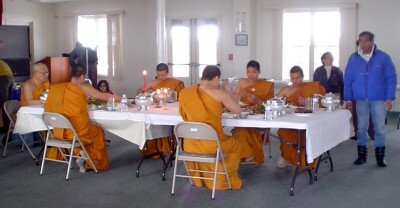 If there are any other monks in the room, and it's meal time, don't even put food on your plate until every monk has put food in their mouth. I won't even start to mention how offended a Thai would be if you break this rule. Quite often you might even be expected to serve them food. Elders eat first. If there is anyone at the table a significant age older than you, say 5+ years, don't eat anything until each of them have put food in their mouth. It would be considered being disrespectful to your elders if you eat before them, as if you have the nerve to forget about their well-being first. But what if the elder doesn't eat or isn't hungry, or just taking too much time? Easy, offer them to try some food. Anything reasonable to hoax the elder to eat is fair game (just kidding). The elder sits at the head of the table. This isn't much different than the western tradition of sitting the most important person of the occasion at the head of the table - the birthday boy, the company boss, a guest speaker, the guy who is paying for the food, etc. But in Thailand, its all age based. So what about a situation where you would be eating with others from your company, and your boss is much younger than someone else in your company, who sits at the head? Good question . . .
Eat 'chinese style' or 'family style.' Most people familiar with asian restaurants know how this works. At a restaurant (or at home) the group orders food together, and when served it is placed at the center of the table. Then everyone can take whatever they want from the center plates and place it on their own plates. At first it may seem a little strange, but when you aren't familiar with half the foods you see, wouldn't it be better if you can sample a little of everything? And of course, everyone splits the cost when it comes time to pay. Ok the above rules seem fairly normal, reasonable, or just plain obvious, right? Now I will talk about the weird and counter-intuitive rules. Don't eat all the food on your plate. That's it. If you finish all the food on your plate, you are insulting the cook or host. You are telling them that they didn't feed you enough, and that they are poor cooks. For a westerner this rule may be a little hard to follow. In western culture we are taught to 'clean your plate.' 'How dare you not eat your beans, there are starving kids in Ethiopia!' But don't worry this rule isn't followed to often. At restaurants its perfectly ok to clean your plate. 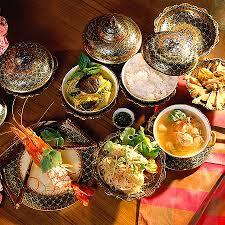 If you are invited to eat a Thai persons house where an elder cooks the meal, then follow the rule. Only put enough food on your plate for a mouthful or two. In western culture it is considered normal to 'pile it on' when it comes to food on your plate. As long as you can finish it, its ok to put as much food on your plate as you want. But in Thai eating etiquette, this is very impolite. You should never put more than a few mouthfuls of food on your plate at any time. This rule isn't very important to follow when you eat with the younger Thai generation, but with the older generation this is very important. I remember getting my friends' parents really mad at me because I started to 'pile it on. Spoons and forks (a knife is not the norm). Occasionally chopsticks are used only for noodles. Customarilly the spoon is held in the right hand and the fork in the left . The spoon is used like a knife (most food items are already chopped to small sizes excpetion being seafood so in that case us rhe spoon like a knife. The fork is used to guide the food to the spoon. As for the sticky rice, custom is to eat it with the fingers. Eat pizza with a fork and knife. 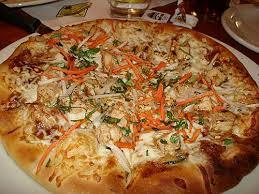 In Thailand, pizza is NOT a finger food. Never stab food with your fork. If you are ever going to use a fork, only use it to scoop food onto your spoon. Thai people either use chopsticks when eating Chinese food, or they use a fork to scoop food onto a spoon when they eat thai food. Oh, and the spoon always goes in the right hand, the fork in the left. When passing food to an elder, NEVER pick up the plate to do so!!! You must slide the plate across the table. Plate being lifted up = bad.